Whether or not you see Pontiac’s constant reshuffling of the Bonneville nameplate as either a total commitment to the name or a lack of commit thereof, there’s no disagreement that the name Bonneville appeared on a wide array of very different vehicles in its 50-year history. After its early appearances as a 1954 Motorama show car and then a 1957 high-performance convertible within the Star Chief line, the Bonneville soon took over as Pontiac’s flagship in 1958, gaining a full portfolio of body styles by 1959. The next two decades saw the Bonneville move through five successive generations, all full-size, rear-wheel drive, and V8-powered, despite greatly varying dimensions. With the exception of the years 1971-1975, when Pontiac offered its range-topping Grand Ville, the Bonneville comfortably sat at the top of Pontiac’s hierarchy from 1958-1981. By 1980, things started to get weird. Convertible and hardtop bodystyles had been gone for several years, manual transmissions were long gone, and now with a V6 the standard engine, there was no doubt that the Bonneville had evolved significantly from the high-performance, sporty and flashy large car to a far more subdued, softer, and more luxurious full-sizer. A consequence of a recession and oil crisis, new car sales took a hard blow across the board, with sales of full-size cars suffering the most. Pontiac was hit especially hard, with brand sales going from over 900,000 units in 1979 to under 500,000 in 1981. 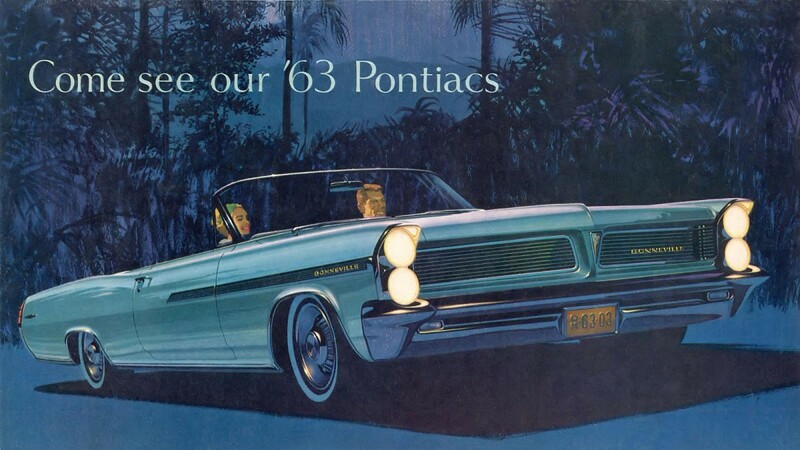 Faced with an split-identity crisis as a maker of both large, soft, “Brougham-y” cars and sporty, performance and youth-oriented vehicles, a beleaguered Pontiac echoed Chrysler’s move that same year and axed all of its full-size vehicles (Bonneville, Catalina, and Safari), re-branding itself as GM’s “We Build Excitement” division as it called to its performance past. This left Pontiac’s mid-size A-body as the brand’s largest offering for 1982. Not wanting to totally alienate Brougham-seeking Pontiac buyers, in some further shuffling around, for 1982 Pontiac moved the Bonneville name to the A-body thereby terminating the LeMans (1979 model pictured) name in the process. To make things more confusing, GM also released the new front-wheel drive A-body for 1982, resulting in the rear-wheel drive A-body’s change in name to the G-body. 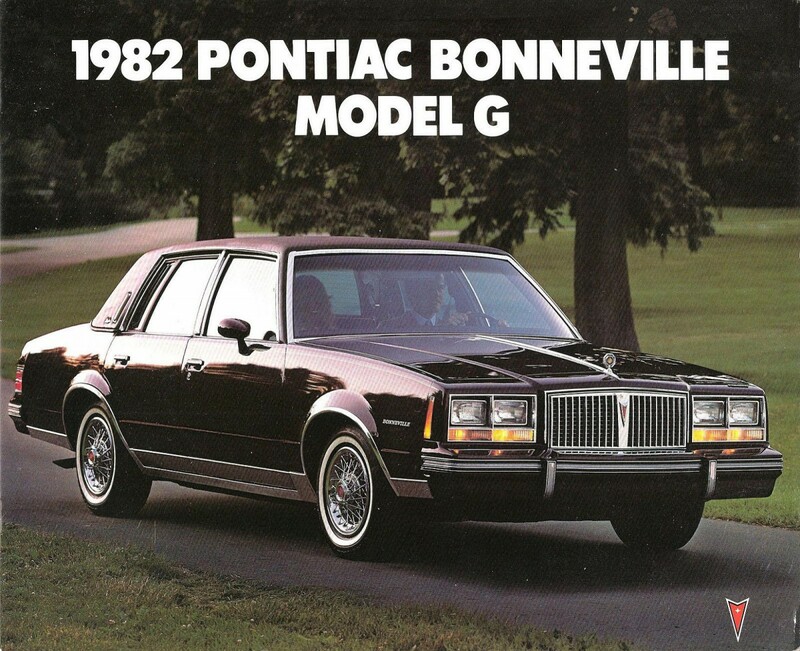 Likely an attempt at quelling some of this confusion, 1982 G-body Bonnevilles added the “Model G” suffix and proudly displayed it on a separate trunk badge. To make matters even more bewildering, Pontiac’s Canadian market Parisienne B-body was never discontinued, and the G-body (neé A-body) continued going by the Grand LeMans name. Over the 1981 LeMans, the Bonneville Model G’s enhancements helped make it the best-looking of all the A-/G-body four doors produced, in your author’s personal opinion. Clearly a nod towards the Bonneville’s market positioning, the Model G was graced by an elegant new waterfall grille and “upside-down” quad headlights with lower turn signals, replacing the more aggressive vestigial beak front fascia of the LeMans. With a squared-off “formal” roofline (introduced on the LeMans the previous year), statelier front clip, and plusher interior, the Bonneville Model G aimed at providing most of the same virtues of its B-body predecessor in a trimmer package. What it didn’t provide was non-diesel V8 power (initially), a coupe body style (now sold exclusively as the Grand Prix), and rear windows that actually rolled down. The last of Pontiac’s own V8 engines were dropped after 1981, as Pontiac redirected its engine focus to the Iron Duke inline-4s. Instead of offering one of Oldsmobile’s gasoline-powered V8s like its Cutlass Supreme and Regal siblings, the 1982 Bonneville only offered a choice of two Buick V6s (3.8L and 4.1L) and a diesel Oldsmobile V8 (5.7L). Regular V8 power was restored for 1983, as the optional 4.1L dropped in favor of a 5.0L Chevrolet V8. The “Model G” suffix also disappeared for 1983. For its first two years, the G-body Bonneville came in three flavors: base sedan, base wagon, and Brougham sedan. All came equipped rather spartan by today’s standards, with power steering, full coil suspension, front disc/rear drum brakes, velour upholstery, and deluxe wheel covers occupying most of the standard features list. 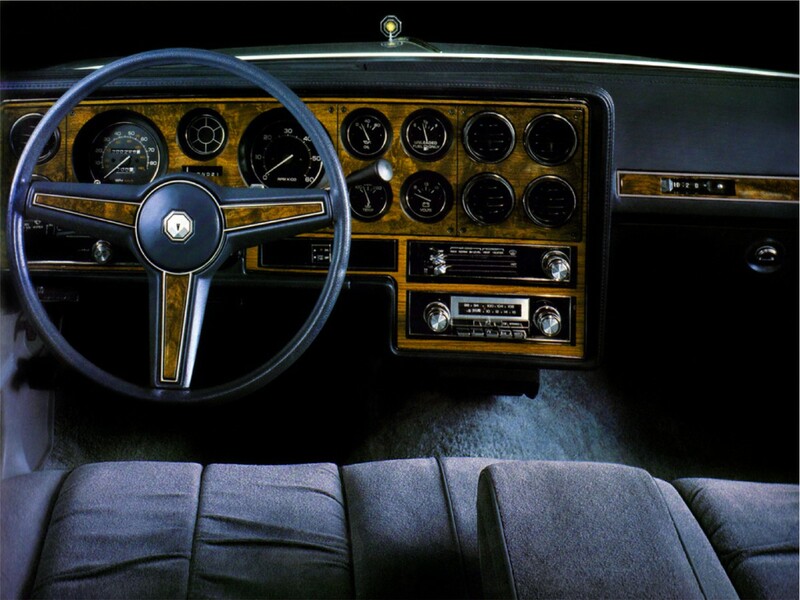 As with its Grand Prix sibling, the Bonneville featured a distinctive instrument panel design with a superfluity of simulated wood trim and round gauges/vents. The contrasting woodgrain patterns was certainly a bit odd though. Base models came with a single-piece notchback bench with fold-down center armrest, while Brougham sedans added a 60/40 split bench, in addition to opera lamps, padded steering wheel, and greater acoustical insulation. 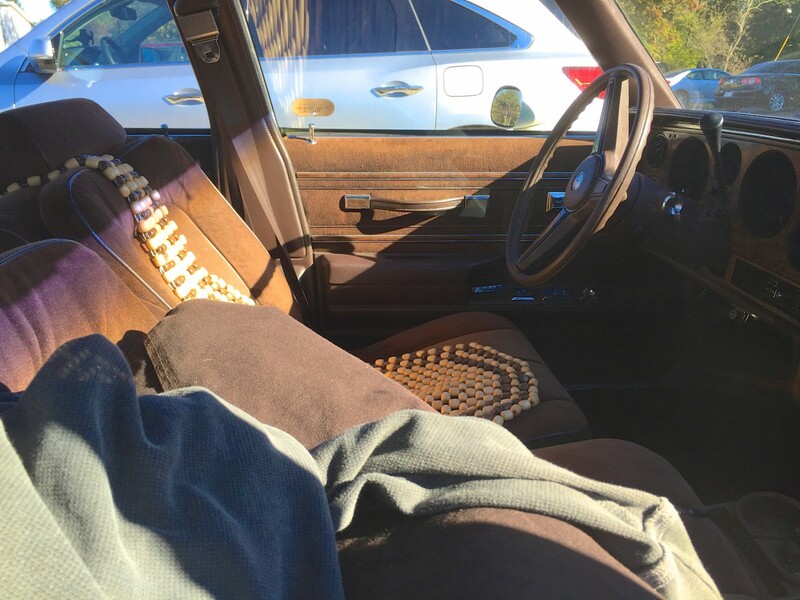 Brougham models also added upgraded velour seats with the former B-body Bonneville’s loose pillow design. Naturally, a lengthy list of options were available for extra cost, such as air conditioning, several radio choices, power locks and front windows, power front seat, rear window defroster, and several wheel choices. Oddly enough, wagon versions did not carry the “Safari” moniker, as their LeMans predecessor did. With the B-body Bonneville/Catalina Safari wagons also absent for the 1982 model year, Pontiac sold no Safari-badged wagons for 1982. 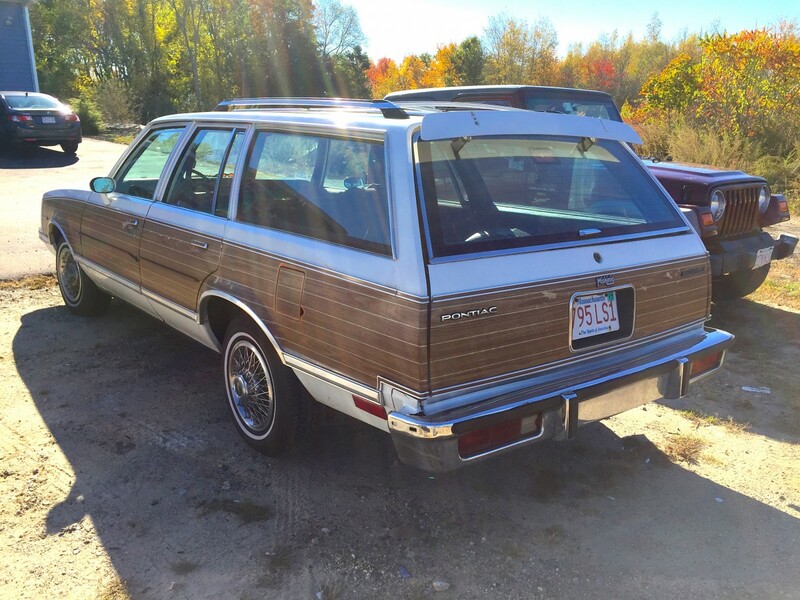 In any event, the big B-body Safari wagon did return late into the 1983 model year, following the re-introduction of B-body Pontiac sedans (now using Canada’s “Parisienne” name) to the U.S. market amidst subsiding fuel prices. Thankfully, Safari name or not, Bonneville Model G wagons were still available with the same yachts deck-like simulated woodgrain pattern Pontiac introduced on its wagons for 1980. Just like the other A/G-body wagons, seating was strictly for six passengers, as no third row was provided. Taillights were still mounted low in the rear bumper, something common practice in the 1960s, but a somewhat unusual design feature by the early-1980s. Due to their very small size and unadorned simplicity compared to the sedan’s taillights, these taillights tended to look like merely reflectors or rear fog lights, thus giving the trunk an unfinished look. Wagons comprised of about 20 percent of “Model G” Bonneville sales for 1982 and 1983, with 16,100 and 17,551 finding buyers, respectively. 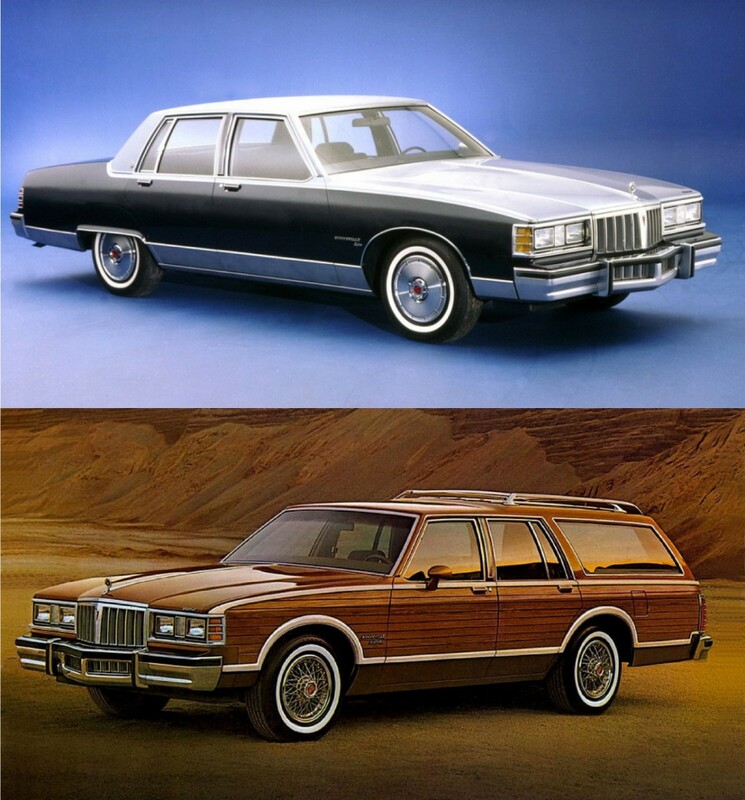 While these figures were only a nod more than half of 1981 LeMans wagon sales, they were also nearly double the combined 1981 sales of Pontiac’s B-body Bonneville and Catalina wagons. 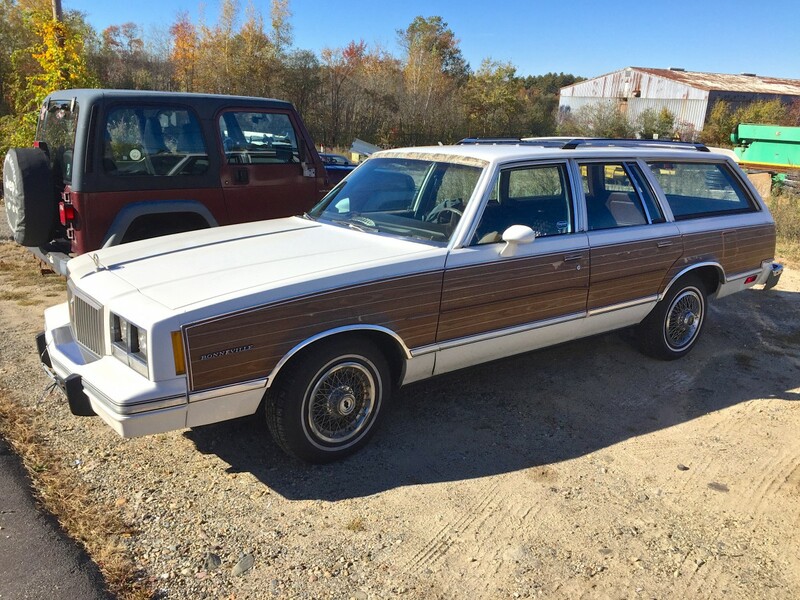 Nonetheless, with the return of the big B-body Safari in 1983 and the new front-wheel drive A-body 6000 wagon debuting for 1984, Bonneville wagons were eliminated following 1983. As for the G-body Bonneville sedan, it stuck around through 1986, upon which it was replaced by the new front-wheel drive H-body Bonneville. Despite a similar footprint, the H-body Bonneville was internally roomier, thus earning it a full-sized designation which the Bonneville was known for. As the de facto replacement for the now permanently discontinued B-body Parisienne, the Bonneville was once again Pontiac’s largest, most prestigious car, ending this somewhat confusing tangent of the nameplate. “By 1980, things started to get weird.” is the best line I’ve read this week! Pontiac’s overuse of “Bonneville” was not as bad as Oldsmobile’s confused use of “Cutlass”. In my opinion of this generation, Buick did the coupé best and Pontiac did the sedan best, and in any case, the Bonnie’s dash and steering wheel were the best of the entire lot! At least when Oldsmobile called every other car a Cutlass, it was still only used for mid-size vehicles (Cutlass Calais notwithstanding). man, that wagon with the taillights in the bumper just looks goofy. I think the wagons rear end treatment is well done. The tailgate is full width without the intrusion from the lights, so its more useful. The lights help give the rear end a horizonal theme emphasising a lower, wider look. The unexpected position of the lights just looks cool. 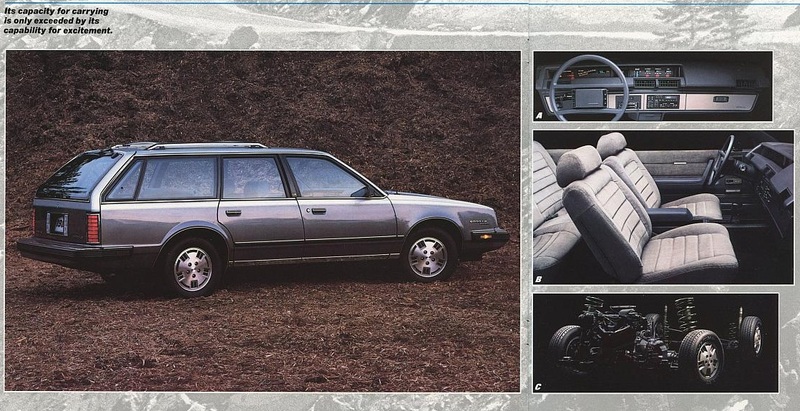 This look is positively daring for a GM wagon. A center high mounted stop light by the rear glass would be useful. If you follow one of these too closely (tailgating)….you cannot see the tail lights. I recall reading a story that these were one of the main reasons for the high-mounted taillight. Really it was just a continuation of the previous colonnade generation’s wagon taillight treatment. Clean and simple, though more expensive to repair when rear ended. Actually that looks like a rear bumper from an El Camino. +1… I thought I was the only one who noticed this back in the day! I believe it is a shared piece and that the El Camino of that generation was actually on the same frame as the G-body wagons. Of course taillights in the bumper also lets you have a nice wide tailgate on a much smaller chassis. the 78-87 El Camino was a stretched version of the 2/4/wagon frame. The W80 had a 117″ wheelbase where the wagons 2/4 doors were on a 108″ wheelbase. they were actually longer than the 73-77 El Caminos! Prior generations were based off the wagons, the final version was loosely based on it. The bumper is definitely shared. Tailgate might well be, too, though that’s a guess on my part. A family friend in Owego had their hand me down Chevy wagon of this vintage totalled by being rearended about 10 years ago. The offending party claimed to not see the bumper mounted brake lights and was expecting there to be a high mounted center brake light. The mid-sized colonnade, (1973-77) wagons & El Caminos. And the downsized 1978 mid sizers, both had bumper mounted tail lights. It’s a cleaner look. Back then in 1982, I didn’t know the Bonneville was in trouble. With the 3rd gen Firebird, 6000, J body Sunbird, and coming Fiero. It seems Pontiac was betting more on the youth market. Before reading this article, I had long forgotten the ’81 LeMans was a one-model-year-only frontal restyle wonder. My buddy had an 81 Lemans. I thought it was a clean, sporty look in keeping with the Pontiac look. I remember thinking back then, Pontiac made an error exchanging the clean body-colour front end for the Bonnevilles feeble dwonsized knock-off Lincolnesque grille. It made the car look a little cheap. Definitely a step backwards. I, too, prefer the ’81 nose. Perhaps, since the 2-door bodystyle was being axed after ’81, there was no need to even try to make the Pontiac G-body look sporty. So Pontiac just went full-on brougham with the frontal styling in keeping with making these the “new” Bonnies. That ’81 is one of the most attractive one-year only faces ever, even better looking than the ’80 Aspen/Volare, ’79 Nova and the ’08 Magnum. Very Pontiac. I always associate that one year only ’81 nose with my third grade teacher, Mrs. Wheeler, who drove a very nice white ’81 Grand LeMans sedan with vinyl roof. This was in 1988, so it wasn’t a particularly old car, but I always found it good-looking. Whenever I see this model, I always think of Smokey and the Bandit 2. I do appreciate that Pontiac offered a full gauge package, when most other makes, including other GM divisions, installed idiot lights instead. I just realized that my Grandfather had a 65 Bonneville (we called it the limo)…that thing was huge and loud! And my Dad had an 83 Bonneville G body wagon. Bookends. My aunt and uncle had a G-body Bonneville sedan, the first car Uncle Pete bought for himself after a string of company Citations when he was promoted from the field to the head office of the beer distributor he worked for. Very smooth and quiet, lots of velour and fake wood, those @#$%! fixed rear windows ameliorated somewhat by the fact he and his wife were both non-smokers (still a minority among adults I knew in the mid ’80s). A couple little quibbles; taillights in the wagon rear bumper weren’t a “60s” thing at all at least on domestic cars; they came in with the Colonnades in ’73 and it’s surprising in retrospect they stuck around for the A/G-body generation. Not least because prominent taillights would’ve offered a much-needed canvas for brand differentiation on the back of the wagons. Brand differentiation you say? All they had to do was go like this. Roger628 – This is such a damn brilliant, yet oh so simple idea, that I almost wish we could transport back to this era of cars just so it could become a reality! Subtle changes can sometimes make a huge difference. I’ve never been a fan of the “bumper taillights”, but your suggestion makes all the difference in the world and actually gives a Pontiac familiarity to the overall design. The 1966 Continental had bumper-located taillights, as did 1968 full-size Chevrolets and Oldmobiles, and 1969 Mercurys. I personally loved the bumper taillights on both the 68 and 73 Impalas. 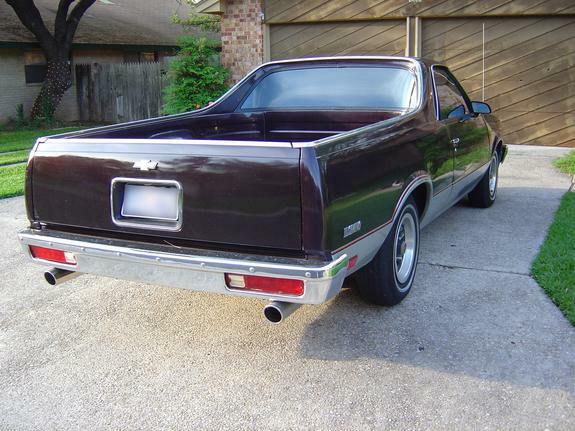 The biggest thing to recommend a G-body Bonneville over a G-body Cutlass would have been the Chevrolet V8. Having owned a G-body Cutlass sedan (307 V8) and having a G-body Bonneville sedan (305 V8) in the high school parking lot – the Bonneville was definitely quicker than the Cutlass and didn’t run out of breath as quickly. Both were much better than the V6! Dad had an Olds V8 and a Pontiac V6. The Pontiac was nicer and more comfortable but the Olds was stronger when it came to hauling stuff. Ah yes, the “Swiss cheese” dashboard. I agree it was the most striking of the A(G)-body designs. I was very familiar with it from my grandmother’s ’79 LeMans. One benefit with the multiple round air vents was that you could really customize the airflow–my grandmother would close off the top “circles” while leaving the bottom ones open so that it wouldn’t “blow in her face” so much. The downside of the design was that the gauge openings were filled with idiot lights if the extra-cost instruments weren’t ordered. My grandmother’s car had the standard gauges, so there were a lot of “blank holes” that only lit up when the car was started. Now I’m sure that I’ve been watching too many episodes of Roadkill, the license plate makes me think this thing needs a LS1 swap, maybe even with 795 whp?! I was thinking the same thing! Maybe that car *does* have an LS1 swap and it’s a personalized plate? My parents bought a new 1983 Brougham sedan right around the time the 1984 models were coming out. I can’t remember why they chose Pontiac, instead of anything else. They wanted a fancy car, but weren’t seemingly that interested in large cars, foreign cars, and I couldn’t talk them into the new 6000STE. The Bonneville was turned into a Mercury Sable in about 5 years. The Chevy 305 made the car seem lively, though I had no real benchmark for comparison as I was driving on a learners permit. I loved the Bonneville because it had reliable, strong air conditioning and the velour seats were extremely soft. Other than that, not my kind of car, but not ridiculous or unpleasant, either. You needed to have the power windows so the foolish rear wind-wings could be opened remotely. Several nice bonuses when buying a wagon over the sedan was a stiffer spring suspension and better rear gears. All V6 A/G body wagons with the std 231 V6 used a 2.73:1 rear gear in place of the 2.41:1. 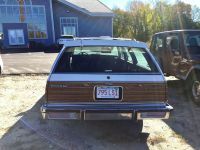 For 1981-82 you could also order your Olds or Chevy wagon with a 5 liter 4BBL V8 engine unlike the coupes or sedans. The LeMans Safari could also be ordered with a larger 4BBl V8 in the form of the 301 but the Buick Century had the smaller 4.3 265 as it’s top gas V8 across the board for 1981. For 1982 both the re-named Regal and Bonneville sedans and wagons could only be had with 2 gas fired Buick V6’s in the form of the 3.8 and 4.1. By 1983 they fixed this mess and made the Chevy 305 available on the Bonneville line across the board and expanded the Olds 307 to all Cutlass models. Buick however kept it’s V6 only lineup right until 1985 after which both the wagon and sedan were nixed. 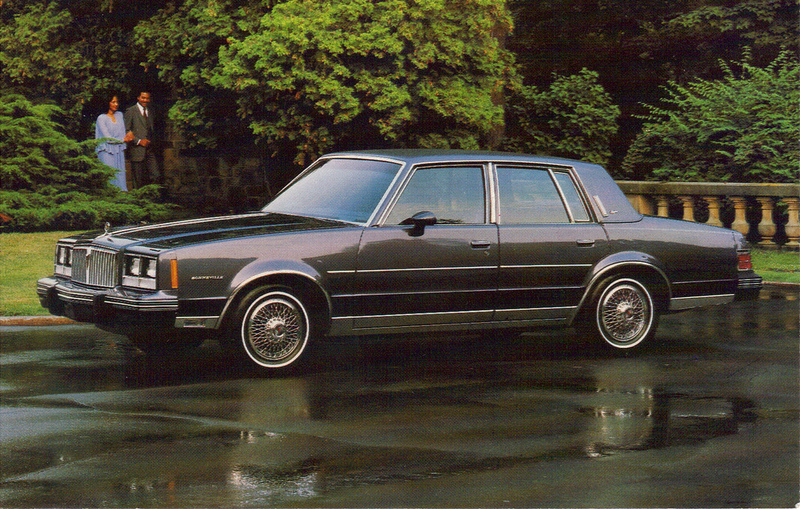 For 1986/87 the Regal coupes could once again be ordered with a 5 liter 4 BBL V8 in the form of the Olds 307. The best engine by far for these cars was the Chevy 305 followed by the Olds 307. I did drive a 1980 Buick Century wagon with the little 265 V8 and it wasn’t bad at all but lacked the 305’s highway passing power. It actually seemed to be similar in power to the Olds 307 oddly enough despite it’s smaller size and 2BBl carb. What’s the piece of bodywork at the top of the rear window? Doesn’t look like a spoiler, and I’m assuming the car isn’t that fast that it needs an air brake, a la Veyron. That air deflector was designed to keep the rear window clean. My Dad’s 1982 Country Squire had one and it actually helped! 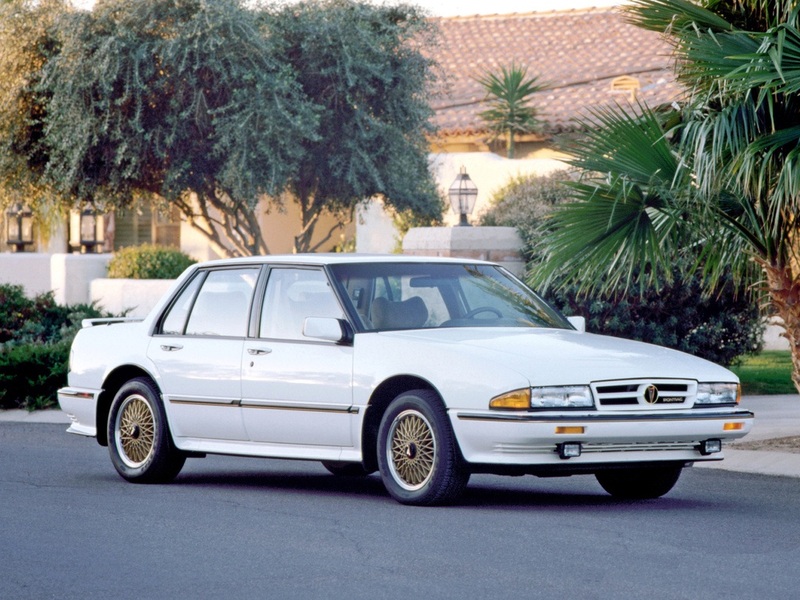 I recall thinking these were mostly handsome when they came out, but it was just another very formal A / G body in the same vein as the Cutlass Supreme and the Buick Regal. The brougham era obsession with wide rocker mouldings with fender extensions did not mesh well with the bumpers. 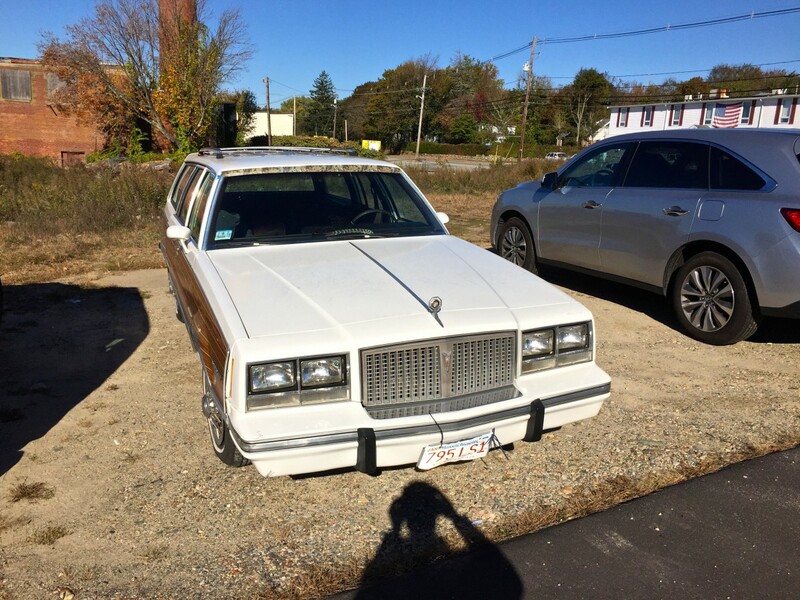 1983 Bonneville sedan….. The final versions had some updates that resolved things a bit, and may be one of the General’s better efforts at tacking on some modern trim to a “shear look” sedan. 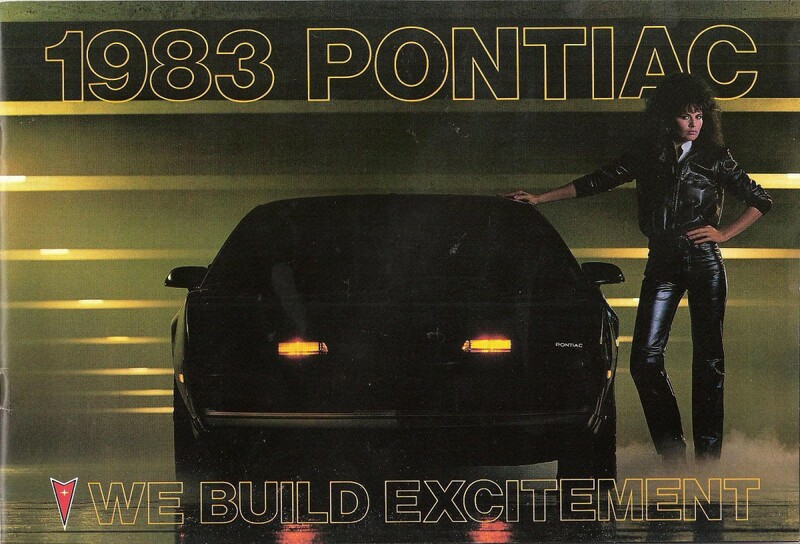 1984…………..
Pontiac dealers demanded the B body to return, and got the Parisienne. DeKalb IL was a ‘Pontiac town’ for example. They had Bonneville cop cars, but had to switch to big Fords after 1981. 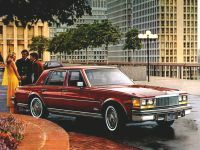 But to me, when new, the ’82 Model G looked like a mix of Olds and Buick styling cues to try to be luxury, but ended up just “what’s it?”. The H body brought back a unique look at least. They only used the Model G name in 82, just calling it a Bonneville after that. The original plan in 1981 was to go completely alphanumeric–T1000, J2000, A6000, but they chickened out quickly. The 6000 never had the A, the J2000 dropped the J in ’83. The Model G was an attempt to keep the Bonneville name, but link it back to the rest of the new alphanumerics. The picture reminds me of my mother’s 1979 Grand LeMans Safari. I always thought Pontiac should have kept the light colored wood siding. Strangely, they went with the dark colored wood of this car in 1980 on the Grand LeMans whiie putting the lighter colored wood on the Bonneville Safari. You’d think they’d want to keep a family resemblance. I saw a dealer ordering guide or prerelease information pamphlet in 1982 that listed the new A body as the A6000. I recall at least one of the buff books referring to the planned two-seater commuter car (or something like that, it wasn’t to be considered a sports car) referred to as the P3000 or some such. SomeLetter3000 for sure. I’m assuming they had to skip over 4000 and 5000 because Audi was then using those designations in North America for the 80 and 100 respectively. I almost bought one of these used in the late eighties as my first car. I think it was the Olds version (Cutlass Supreme Brougham sedan). I liked it because it had the 1975-79 Cadillac Seville look. Now THAT is a gorgeous car! You have almost convinced me to like the looks of these, Brendan. I’ll admit the rear is nice but that frumpy formal roofline and the clunky front end is a deal-breaker, and I can say the same thing about the dumpy “formal” Cutlass and Century sedans of 1980. The big car styling just doesn’t translate as well to an intermediate and they are pale imitations of the very handsome ’75 Seville. I usually like sedans but… pass. The ’78-81 LeMans sedan (and the ’78-79 Grand Am sedan) are MUCH more my style. And the wagon is homely to me. I didn’t like the Colonnade wagons either and I love Colonnades. The full-size ’71-76 and ’77-90 wagons were just much more pleasant designs. I chalk it up to those goofy bumper taillights. Practical? Sure. Safe? Not as much. Attractive? Hell naw. I wish some brave automaker would bring back those “frumpy” formal rooflines. I’m tired of banging my head on the doorframe when I get into the backseat of most of today’s sedans! I was very sharp with cars and knew that no such thing existed. Well that was until I made dad take me to the nearest Olds/Pontiac dealer only to learn that the B-body full size Catalina/Bonneville and Safari were dropped for 1982 and that Pontiac transferred the name to it’s Lemans mid size with a revised Bonneville front end and new wide lower rocker moldings on the sedans. Safari was out and Bonneville it was for the entire line. Also no more 2 door coupe or V8 engine which annoyed dad some as his 6 cylinder Fairmont was a dog and he wanted to move up to a small V8 with his next car purchase effectively scratching this car off his future list. He was happy to then hear a year later that the 305 was being offered but several years later confused everybody by purchasing not only a V6 Cutlass Supreme but a 4 cylinder Ciera of all things. Nice writeup on these often-overlooked Bonnevilles; at least where I am there are still a few running around in regular service. 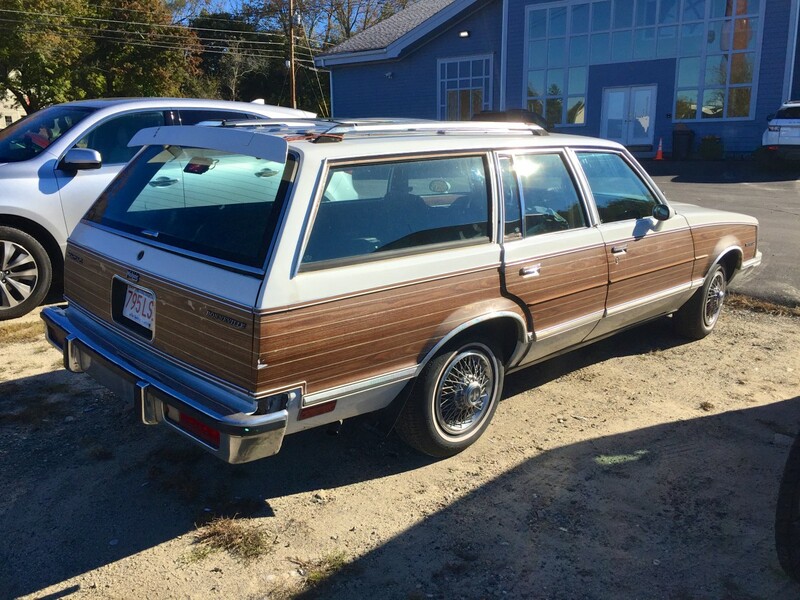 A friend’s mother had one of the sedans back when I was a kid, but I had rarely seen the wagon version. I suppose if it was only around for ’82 and ’83 that explains why. I just can’t muster much enthusiasm for the design though–the Bonneville is probably my least favorite G-body (though the ’82-’85 Regal sedan is a close second, saved only by its attractive taillight design). The A-body LeMans, on the other hand, I really liked, though its “beaked” nose is a bit polaraizing. To me, the formal roofline doesn’t seem to mesh as well with the tallights/decklid which were very similar to the ’81 design, and the nose design seems to be a slightly uncomfortable blending of straight lines with oddly placed curves (like the convex detailing around the grille) and the peculiar-looking dip in the body-color bumper cap. They’re not bad-looking; I just prefer the Olds and Chevy varations. The Cutlass Supreme is by far the best looking of the “G” sedans IMHO, and previous to the A/G designation switch, I’m a partisan of the Malibu (for obvious reasons). 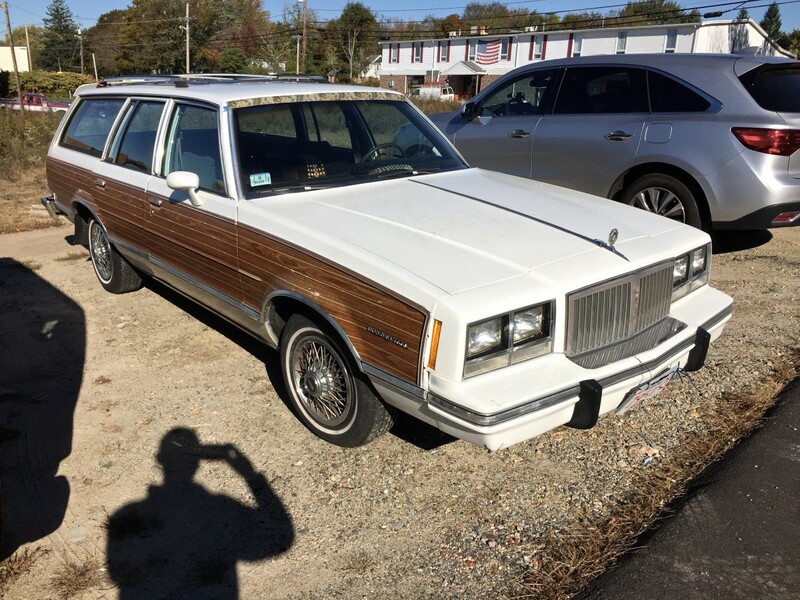 You mention that Pontiac went to the “yacht decking” woodgrain for 1980, also, but I thought they had something similar previously? I photographed a ’79 Grand LeMans Safari some time ago, and while most of the dinoc was sun-faded to oblivion, what I could see of the pattern looked to have the same “decking” look but in a lighter blonde color. My favorite Bonneville is my buddy Gary’s MINT blue ’64 convertible coupe with the factory tri-power and 4-speed.. From back when the Bonneville name meant something. Don’t get me wrong tho, I love the G-bodies, had one as my first car but there’s no substitute for the Bonnie’s of old..